My guild has been enjoying conquest after the revamp too. It’s given us something appealing to work towards together, especially with the guaranteed mat rewards once you hit the medium or high yield. FYI, there’s one week with more than three invadable planets — Total Galactic War now has all 19 planets and next appears in the week starting 7/17. 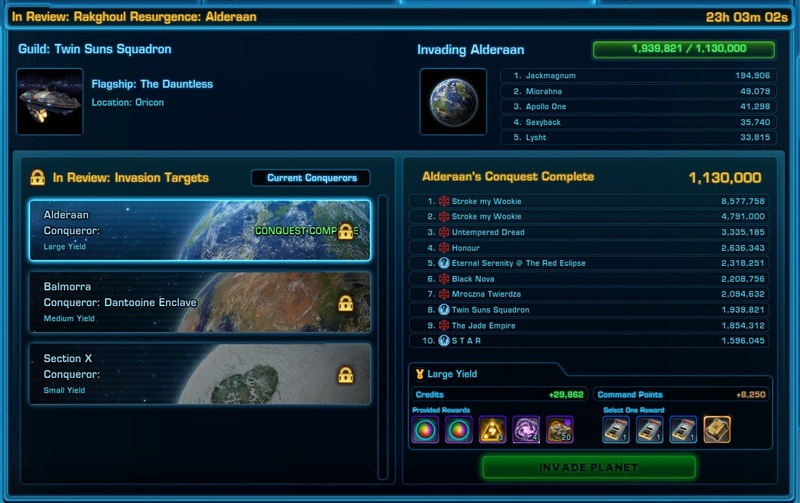 I agree it’d be nice to have more planets more often to give more guilds a shot at conquering planets. Ooh, if they are really bringing back the full 19 planets for the next Total Galactic War that would be cool. Where did they announce this? I must have missed it. Though I guess as long as they do not put the lockout on the actual invading back in, there'll be the potential for some unpleasant surprises until very late into the week. SWTOR miner pulled the info from the game files: https://torcommunity.com/miner/Conquests.xml. I’ve put all the weeks through the end of July in a spreadsheet that calculates everything for you and will add more weeks once I’m back from my honeymoon: https://docs.google.com/spreadsheets/d/1GoP6oVUROvpujs70ro6pSP3yH-Ez_zRYGnyEVViWEs8. Thank you :) And thank you for writing interesting articles. I read them every week even if I don’t comment every time.